A cheap and cheerful hedgetrimmer, $50 at Bunnings. To be used for occasional trimming of hedges (well duh) in between visits from Andy, my trusty gardener… specifically around the back of the house, where sometimes the hedges grow so fast it feels like the open space in the garden is getting a little smaller everyday. No, I don’t plan to go all Edward Scissorhands and do any topiary… though having looked at some of the examples on the Wikipedia entry for it, I reckon it’d be pretty funny to develop one that was, say, Dalek-shaped. PS Did you open a special account to save up for the trimmers? If so, it would have been a hedge fund. 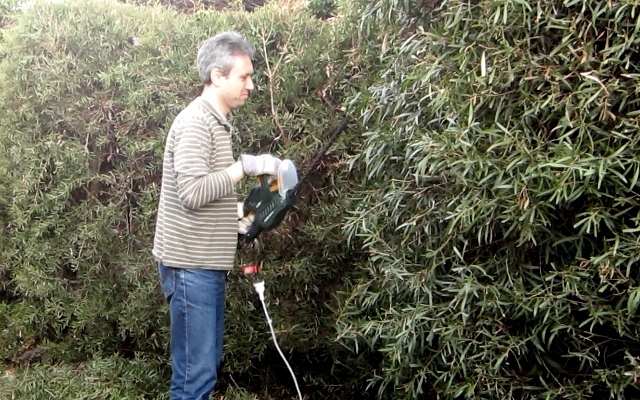 This must be catching – I bought a hedge trimmer a couple of weeks back, one of the Ryobi One models with no cord. No Daniel, it would NOT be funny to have a Dalek shaped hedge! @rae – it’s funny when the dalek topiary does not reside at the house in which you (or me!) live! @ rae (again). I think that should be you or ‘I’, not ‘me’. But you get the nub of my gist? watch out for wasps in residence. their stings hurt and hang around as itchy welts for months. Eye protection Daniel, eye protection. Safety specs about $8 also at Bunnings. looks more of a jungle than a hedge. it should be as flat as a station platform on the sides, and as level as train tracks on top. I’m with you @Marita!! @Daniel – go for it!